Mt. Field is tagged to be one of Tasmania’s most loved national parks. The park has a wide variety of scenic features and wildlife. It offers a great range of facilities for day visitors. Few other national parks in Australia offer such diversity in vegetation, ranging from tall swamp gum forests and massive tree ferns at the base of the mountain, through rainforest along the Lake Dobson Road, to Alpine vegetation at the higher elevations. Mount Field National Park is 60 kilometres (37 miles), or about an hour's drive, North-west of Hobart. From Hobart, take the Broker Highway (A10) to New Norfolk, and then follow the road on either side of the Derwent River (the A10 or B62) until you reach Westerway. From here, drive along a winding bitumen road to the clearly marked entrance to Mount Field National Park, just before the small township of National Park. Annual passes and two-years passes are also available. Actually, Mt. Field National Park was the very first national park that I’ve visited here in Tasmania. I went with my partner and several of my friends a few months back and the best part during my visit: Summertime!!! Well, the moment you enter the Park, expect to see a variety of native flora and fauna (if your lucky). The most famous of which are the huge man-ferns and the tall trees. There are a number of walk paths that you may take. 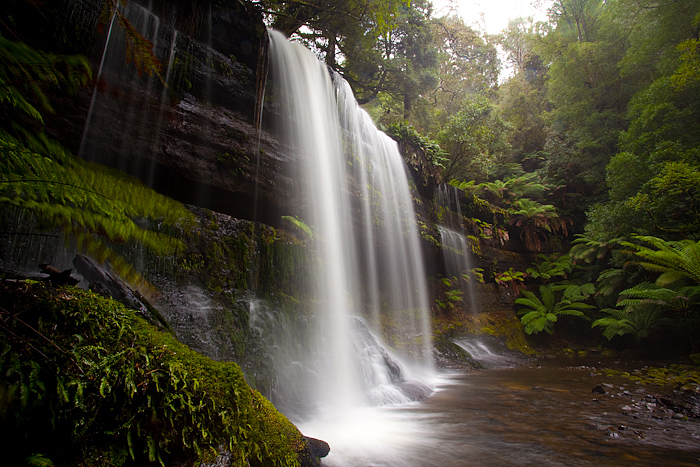 There’s the beautiful Russell Falls, considered to be one of the highlights of the Park. You can also take the Tall Trees Walk, Pandani Grove Natura Walk, Seager’s Lookout, Marriotts Falls, Tarn Shelf, Lake Nicholls, Lake Webster and other adventure sites. There’s an accessible camping ground and caravan park for those who wish to stay during the night and witness the amazing wildlife. There’s Government huts, Lake Dobson shelter and picnic facilities. The park is open for 24 hours. Personally, I enjoyed my short adventure at the Mt. Field and I would highly recommend Mt. Field National Park to nature lovers, forest trekkers, adventures or those who wish to enjoy bush walking. It is recommended for family, couples, photographers and solo travellers. DISCLAIMER: I do not claim copyright for the photo(s) posted above. If you happened to be the original owner of the photos just send me a message and I shall remove them immediately. and this is such a beautiful place! me and blogs are following you now in google..
Nice website you have there. I notice you're using my Russell Falls picture on your website. I'm happy for you to continue using the image but can you please credit the picture myself with a link to http://www.alexwisephotography.net/blog/2009/06/24/russell-falls-mt-field-national-park/ or otherwise if not, remove the image from your website?